Don't ask about what's happening here. For this writer, Jedi was the first Star Wars movie I ever saw on the silver screen. I must have been 6? I was given a book where you played a cassette along at the same time and I duly memorised it. I also recall borrowing the novelisation (with pictures) a million times from the school library. Ewoks were a late addition to the Star Wars mythology. Their part in the story was to be played by the Wookiees, but by the time Lucas and his production partners sat down to write the Return of The Jedi script, they realized that, because Chewbacca could fly the Millennium Falcon, repair the ship and operate pretty much any weapon or machine in the known universe, they'd made the Wookiees too technologically advanced for the plot. Yoda was to sit this one out, but he was added after consultation with child psychologists helped George Lucas decide he needed an independent character to confirm Darth Vader's claim that he is Luke Skywalker's father. Now you know why Yoda doesn't do much for the rest of the movie. That and the fact he died of old age. "It's a trap," which is arguably the most famous line in the movie, was, incredibly, not in the screenplay. The line was scripted as "It's a trick!" and was later changed post-filming after a test screening because, let's face it, "it's a trick" just doesn't have the same ring to it. Recall though that Leia calls out the line to Luke on Cloud City in Empire! Admiral Ackbar's backstory was that he was once the slave of Grand Moff Tarkin, as well as his personal pilot. This is no longer canon. Ben Kingsley, who played the title role in the 1982 movie Gandhi, read for the role of Emperor Palpatine and “was considered ‘very English.’ That said, Palpatine was eventually played be Englishman Ian McDiarmid... there's a reason why so many English actors are in Star Wars. David Lynch was originally offered the chance to direct this episode of the series. He turned it down because he believed it was "Lucas' thing." He went on to direct the Dune movie instead. It's actually really interesting how much Frank Herbert's book influence the original Star Wars script development. In the DVD 2004 release, Sebastian Shaw (older Anakin Skywalker) is replaced in the celebration scene by Hayden Christensen. Many fans did not understand, nor appreciate this. Darth Vader's funeral pyre scene where Luke stands over his father was added at the very last minute, long after principle photography and pick-ups had wrapped. The scene was thrown together and shot near the hills of Skywalker Ranch. 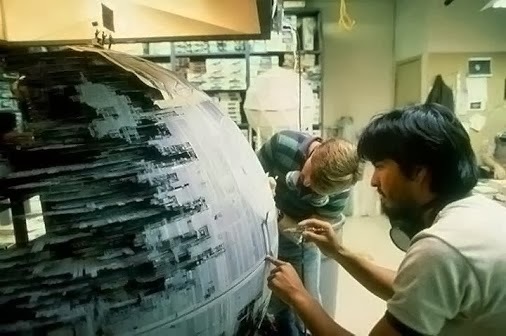 It took six people to work the full-sized animatronic of Jabba the Hutt. Legend has it that Jabba was inspired by the Emperor of the Dune novels. This is the first Star Wars film to show a lights saber combat something other than another light saber. Luke on the Sail Barge fights guards with staffs and blasters. This perhaps a call back to the original movie where Luke wears a blaster helmet and tries to anticipate shots from the Remote on the Millennium Falcon. This shows the progress Luke has made as a Jedi Knight. Listen very carefully as Darth Vader picks up the Emperor and throws him down the Death Star shaft. This is the only time the Jedi theme music plays over a shot of Vader, reflecting his return to the light side of the Force. After appearing in this film, Wedge becomes the only X-wing pilot character (apart from Luke) who survives all three major battles in the films. The film was originally going to be called Revenge of the Jedi until Lucas decided that Jedi do not seek revenge. This was quite late in the production so there was a lot of promotional gear with the title already printed on it. There's a really cool connection to the classic sci-fi film, The Day the Earth Stood Still. That film's alien character was called Klaatu. In Jedi, the mechanic on Jabba's sail barge is named the same as tribute to the film. This was just a taste of the vast amount of ROTJ trivia out there - if want more try this book, The Making of Star Wars: Return of the Jedi by J. W. Rinzler. Bonus fact - Alan Rickman auctioned for the role of Jer Jerrod. Do you want more Star Wars trivia? Check out these 101 intriguing facts about Star Wars. pretty interesting. What about the deleted sandstorm scene?